What complicates the first edition identification of Beginner Books is that a chronological listing of the titles in the series has been difficult to attain. We compiled the following table to help rectify this issue – it lists the fifty-five Beginner Books produced through 1970 in chronological order. With the exception of The Cat In The Hat, the first printing of each of these has a dust jacket price of $1.95. The price will be printed on the front dust jacket flap either in the form “195/195” or “$1.95”. From 1957-to-1970, we have identified eighteen different Beginner Book dust jacket back covers, and have listed them chronologically in the table below. To help with the discussion, these dust jackets have been enumerated ‘A’-to-‘R’. From this table, we can reference a particular dust jacket to help identify first editions (see table, below). For those with a value system inclined toward pictures rather than words, you can always visit our web page with images and links to each of eighteen dust jackets. DJ ‘A’ (1957) – Only used on the The Cat In The Hat, the first book in the series. DJ ‘B’ (1958) – Used on the first six books in the series. It is not uncommon to find copies of The Cat In The Hat with the listing of six books on the back DJ. DJ ‘C’ (1959) – Not common. One does not often come across The Cat In The Hat or the other six books in the series with this particular back DJ. DJ ‘D’ (1959) – Lists twelve books in the series, is the more common of the two DJ’s used in 1959. DJ ‘F’ (1960) – We have identified three variants with this configuration of listing 18 books in the series. Five first edition Beginner Books have this back DJ title list configuration. DJ ‘G’ (1961) – Not common, used in early 1961, and much scarcer than the type ‘H’ dust jacket used later that same year. Both of the first edition Beginner Books with this title list configuration are quite difficult to come across (BB-19 Ten Apples Up On Top! and BB-20 Go, Dog, Go!). DJ ‘H’ (1961) – Quite common to find the earlier Beginner Books with this DJ configuration listing 24 titles. Speculating …, 1961 is the first full year with Beginner Books operating as a Division of Random House, and potentially could mean an increase in production quantities. 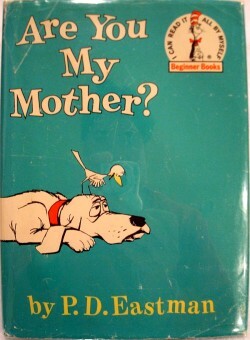 The four first edition Beginner Books published in this era are not too uncommon. DJ ‘I’ (1962) – BB-25, Robert The Red Horse, is the only first edition Beginner Book with a back DJ title list configured with 25 books. DJ ‘J’ (1962) – It’s not uncommon to find earlier Beginner Books with this 28 title list configuration. BB-28, The Big Honey Hunt, is the first book in the Berenstain Bears franchise, now over 200 books strong, and is moderately difficult ‘get’. Given the phenomenal publishing success of the franchise, first editions of the first book in the series should be in demand for decades to come. DJ ‘L’ (1963) – It’s not uncommon to find earlier Beginner Books with this 33 title list configuration. DJ ‘M’ (1964) – Back DJ advertises The Cat In The Hat Beginner Book Dictionary and was used throughout 1964. BB-36, The Bike Lesson, is the second book in the Berenstain Bears franchise. 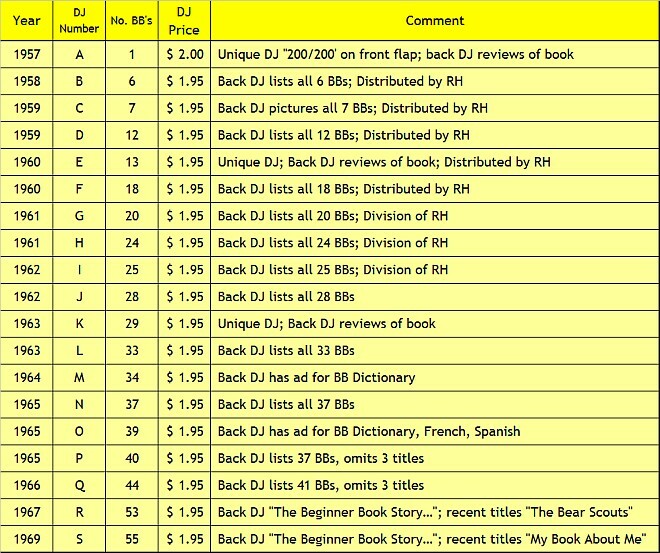 DJ ‘N’ (1965) – BB-37, Fox In Socks, is the only first edition Beginner Book with a back DJ title list configured with these 37 books. This is the last titles listing which is comprehensive, as later back DJ title list configurations omitted some books. DJ ‘P’ (1965) – The back DJ lists through BB-40, however only has 37 titles listed, omitting three. The three titles excluded are BB-4 The Big Jump and other Stories, BB-5 Big Ball of String, and BB-12 Ann Can Fly. It is unclear whether these three books were taken out of publication, or whether their title was simply excluded from the list. Although three new Beginner Books were introduced in 1965 (BB-38 Fox In Socks, BB-39 The King, The Mice, and The Cheese, and BB-40 I Wish That I Had Duck Feet), none of the first editions have this back title configuration. Another peculiarity of this back title configuration is the spelling of Fox In Socks, understandedly misspelled Fox In Sox. DJ ‘Q’ (1966) – The back DJ lists through BB-44, however only has 41 titles listed, omitting three. The three titles excluded are BB-4 The Big Jump and other Stories, BB-5 Big Ball of String, and BB-12 Ann Can Fly. DJ ‘R’ (1967-1970) – Since it was used over a number of years, It is quite common to find earlier Beginner Books with this back DJ configuration. Continued in Part 3, "First Edition Beginner Books"